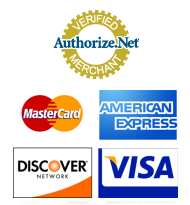 Why do we say our Joint Check is not just another "joint product"? 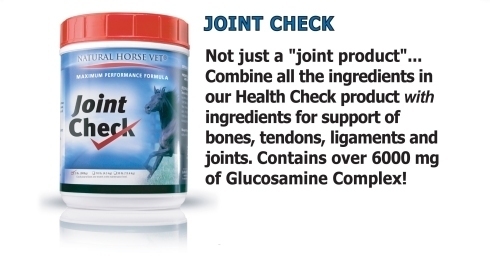 With Joint Check we have synergistically blended the antioxidant power of our Health Check product with potent amounts of time-trusted natural ingredients to provide the support desired for healthier bones, stronger connective tissue and optimum joint function while reducing oxidative stress. Contains 7500 mg. per ounce of Glucosamine Complex (HCL & Sulfate) Also contains Astragalus herb powder and Boswellia extract for even more support! 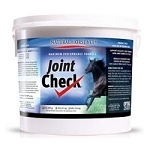 Joint Check is great for any age horse but especially older or younger rapidly-growing horses, as well as working or stressed horses. Astragalus Herb Powder, Citrus Bioflavonoids, DL-Methionine, Eleuthero Ginseng, Fenugreek, Garlic Powder, Ginko Biloba, Grape Seed Meal, L-Lysine, Licorice Powder, Montmorillonite, N-Acetyl-Cysteine, Pine Bark Extract, Yeast Culture. "If you just compare the amount of glucosamine to amounts in other joint products, all the extra ingredients are essentially free!"